New England Patriots TE Rob Gronkowski left Sunday’s game with the New Orleans Saints with a groin injury but not before catching six passes for 116 yards and a touchdown. He hinted to reporters that the injury is not serious, saying ‘I’m good’ after the game when declining to talk longer. 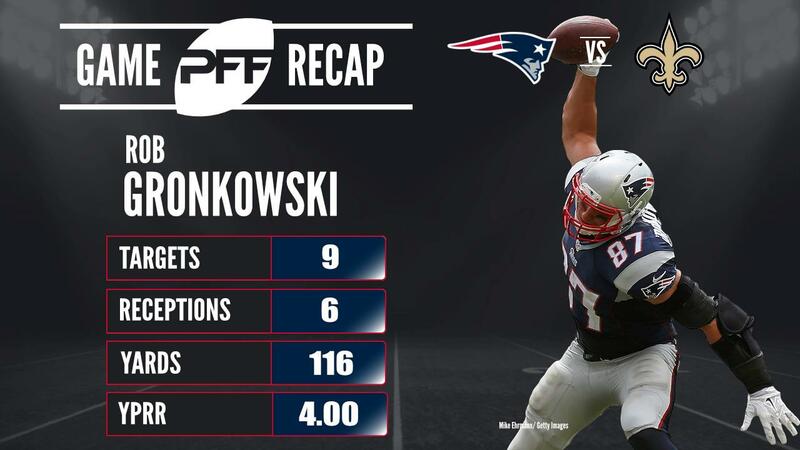 Gronkowski gained 4.0 yards per route run this week, a statistic he has largely made his own over the years. He ranks third overall in yards per route run among TEs in 2017, behind only Hunter Henry and Benjamin Watson, both of whom have around half as many routes run. In 2016, Gronkowski led the league and has done so in four of the past five seasons. If Gronkowski misses any time, Dwayne Allen will be next in line at TE. He saw 46 snaps already this week, the same number as Gronkowski’s shortened day, with Jacob Hollister playing 16 as the third TE.